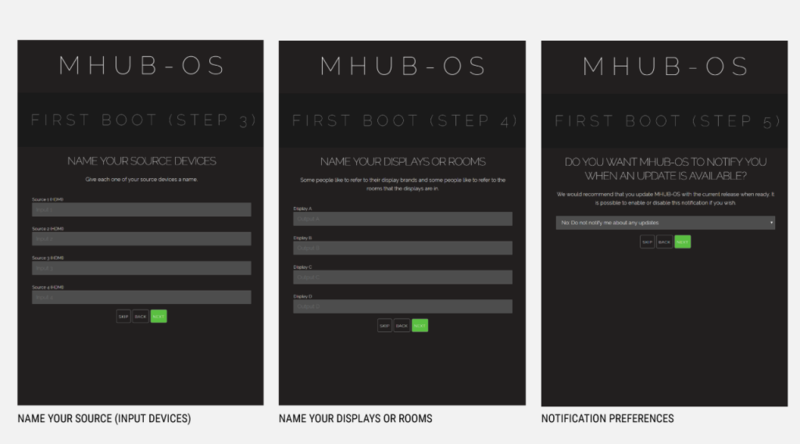 The PRO range of MHUB systems offer advanced EDID management from within MHUB-OS and from the units front panel. 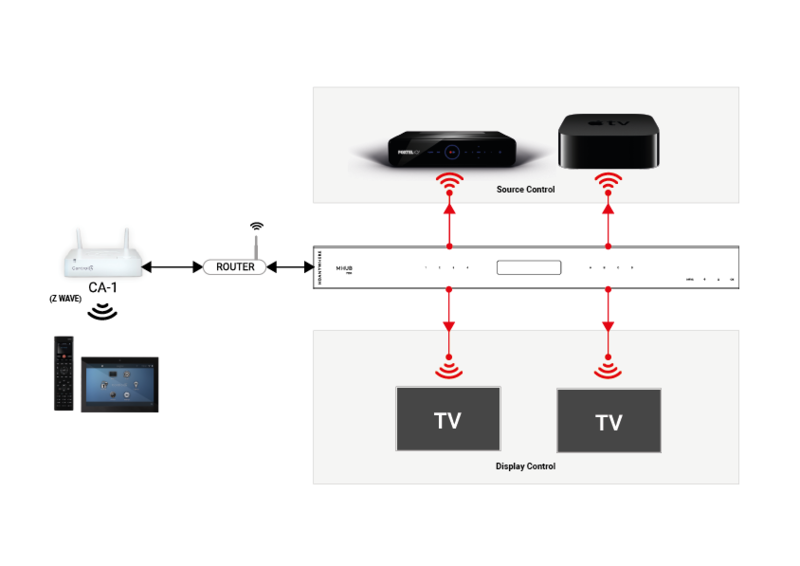 EDID management is an important facet of installing a whole home AV system, and improper configuration will result in a system that doesn’t operate at full capabilities. More and more source devices are limiting there selectable output resolutions based on the EDID they read from the display, as such you may find without proper EDID management that your devices won’t offer you the display resolutions and audio formats you want. EDID (Extended Display Information Data) data exchange is a standardized means for a display to communicate its capabilities to a source device. The premise of this communications is for the display to relay its operational characteristics, such as its native resolution, to the attached source, and then allow the source to generate the necessary video characteristics to match the needs of the display. This maximizes the functional compatibility between devices without requiring a user to configure them manually, thus reducing the potential for incorrect settings and adjustments that could compromise the quality of the displayed images and overall reliability of the system. However, this becomes much more complicated in situations with multiple displays such as a splitter or a video matrix, this is because the device in question must now decide on a single EDID to present to a source device from the available displays. Normally this will be the lowest common denominator, which is ok for initial setup as it will guarantee you have video/audio in all locations. However, this may not be the desired result long term. This is where EDID management becomes important. 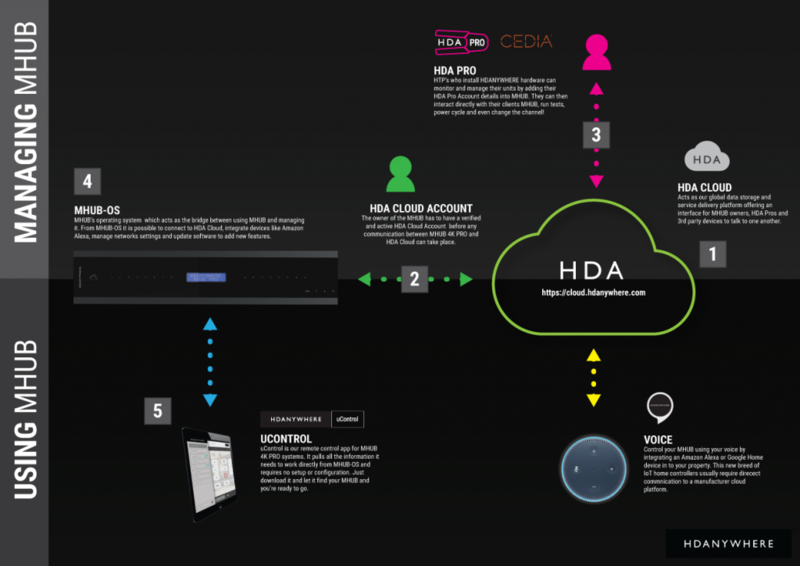 EDID management is the process by which you manually select the EDID you wish to be presented to each individual source device, this ensures you get the desired Video/Audio output from each connected source device and utilise your system to the maximum of its capabilities. This would present a source device with a ‘display’ capable of 4K video with HDR enabled and 2.0 channel audio. 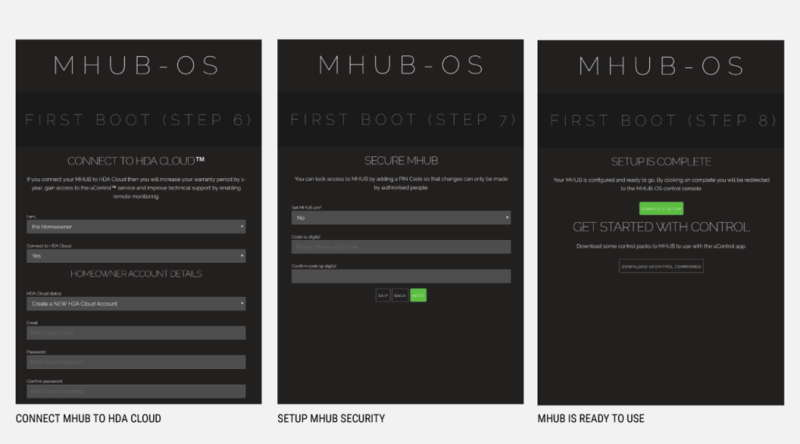 Alternatively, MHUB-OS has the ability to copy an EDID from a connected display. Currently, this is only possible via the HDMI mirror ports. 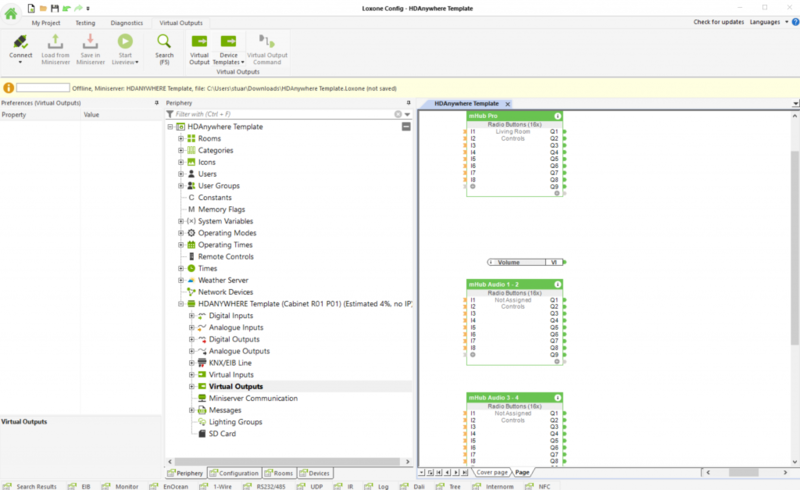 This will make the connected source devices behave as if they are only connected to the chosen copied output. Sequences allow your MHUB to make more complex things happen. For example, a single command could be setup to Turn on a TV, switch to your Satellite box and enter the number keys for a movie channel. 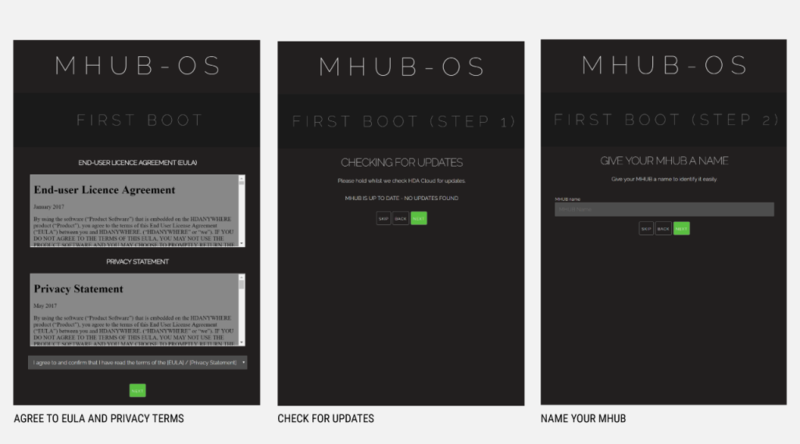 These sequences can be triggered in a number of ways to provide a better user experience for MHUB owners. 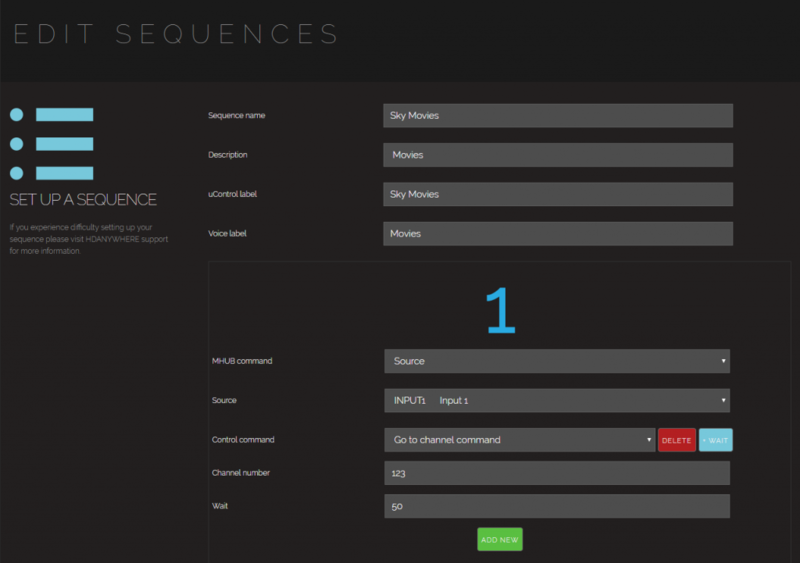 Within this page you can see and edit your current sequences. You can also test all your sequences to make sure they are functioning correctly. To create a new sequence click the ‘Create New Sequence’ button. 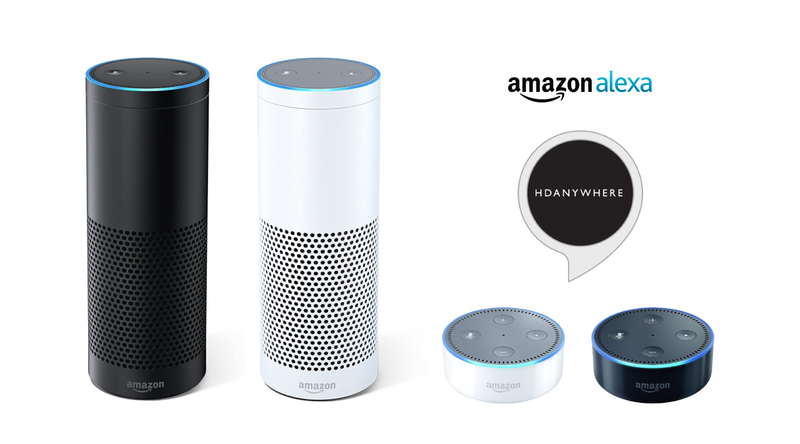 Voice label – This is where voice control (such as Alexa) reads the title of the sequence so it can be triggered. 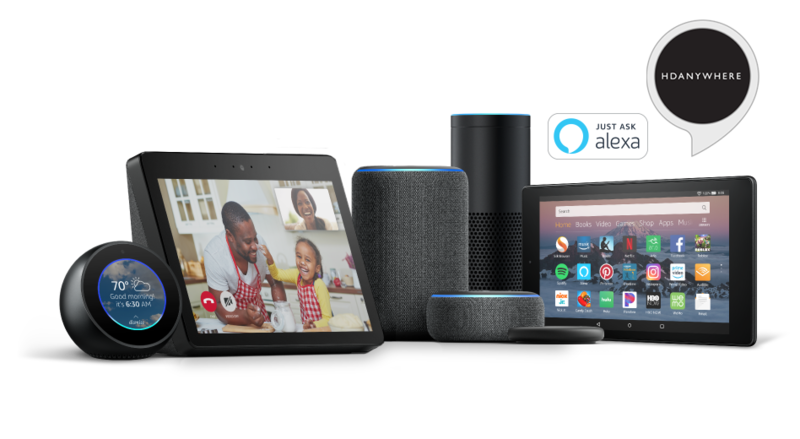 You may find if you are struggling to trigger a particular sequence by voice that you can improve the function by changing the title that your voice control device is listening for. You can either choose to save the command or add ‘another command’ to create a more complex scenario. For instance, in the following example, we have first a “source switch” followed by a “Go to channel command” with a 500ms Delay. 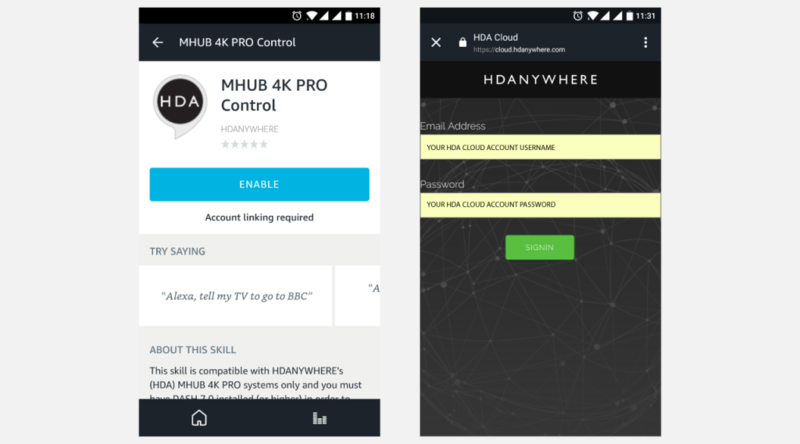 uControl is HDANYWHERE’s free remote control app and is available for iOS and Android mobile platforms. 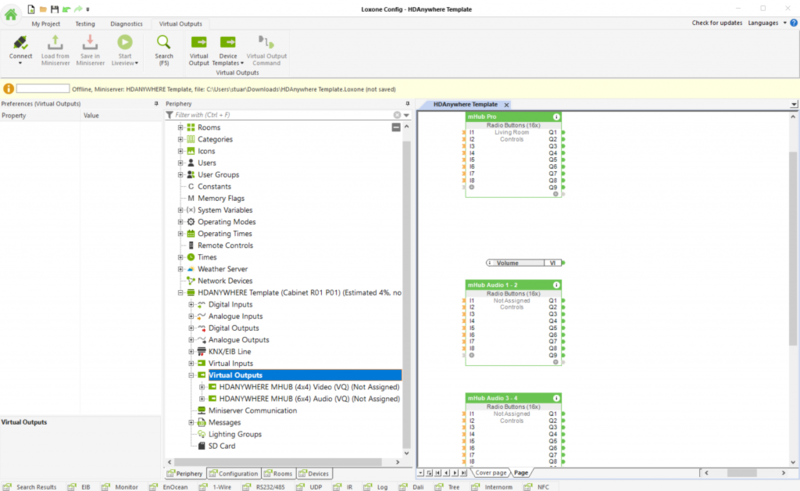 Below is a guide to configuring and then using uControl. Your MHUB is powered on and connected as per the quick start guide (inside MHUB packaging) to make sure your MHUB is connected correctly to your source devices, displays and has an active network connection before proceeding. 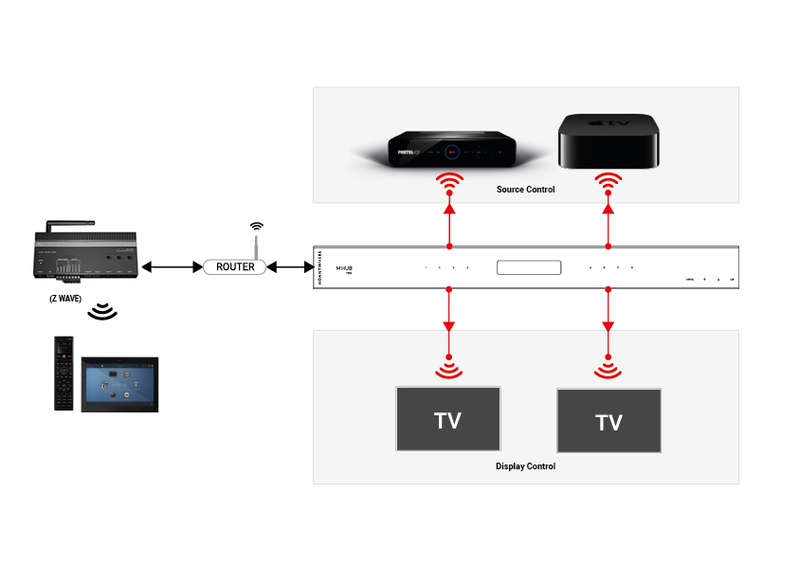 Before using uControl, it needs to be linked to your MHUB. Please follow the instructions below on how to do this. 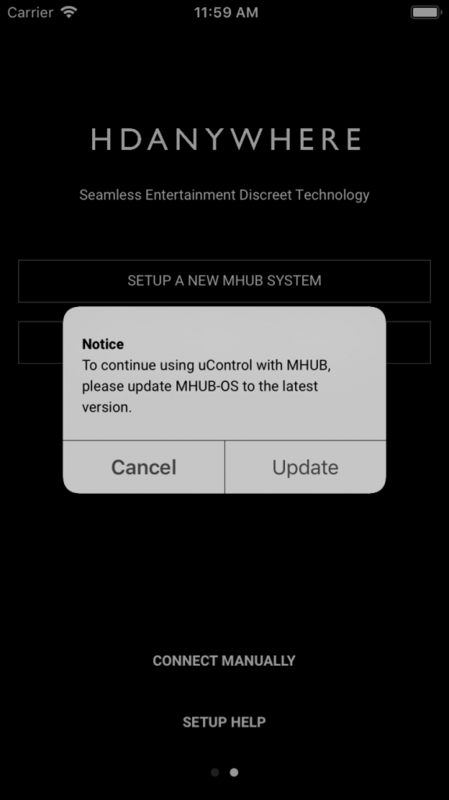 Open uControl and press the ‘SETUP A NEW MHUB SYSTEM’ button. 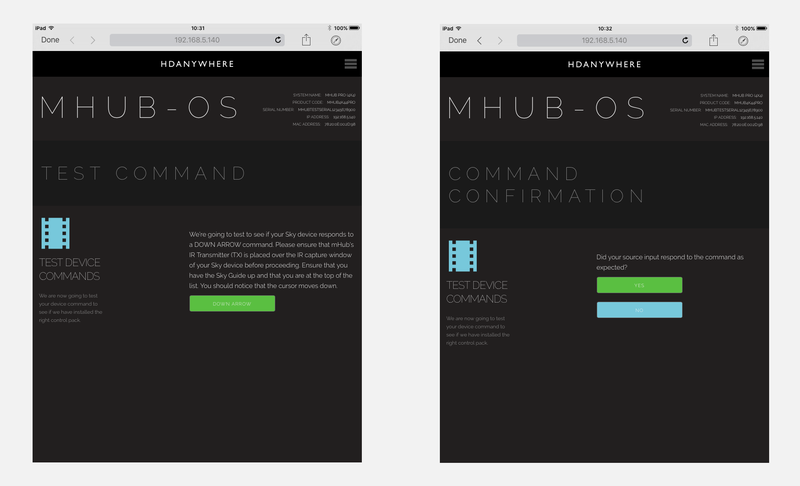 uControl will now search your network for any MHUB devices. After the first boot process is completed you will be shown the following screen. Click ‘ACCESS UCONTROL’ and you will be taken to the main uControl interface. Source switching is performed by swiping left or right on the input bar and tapping on the required input. 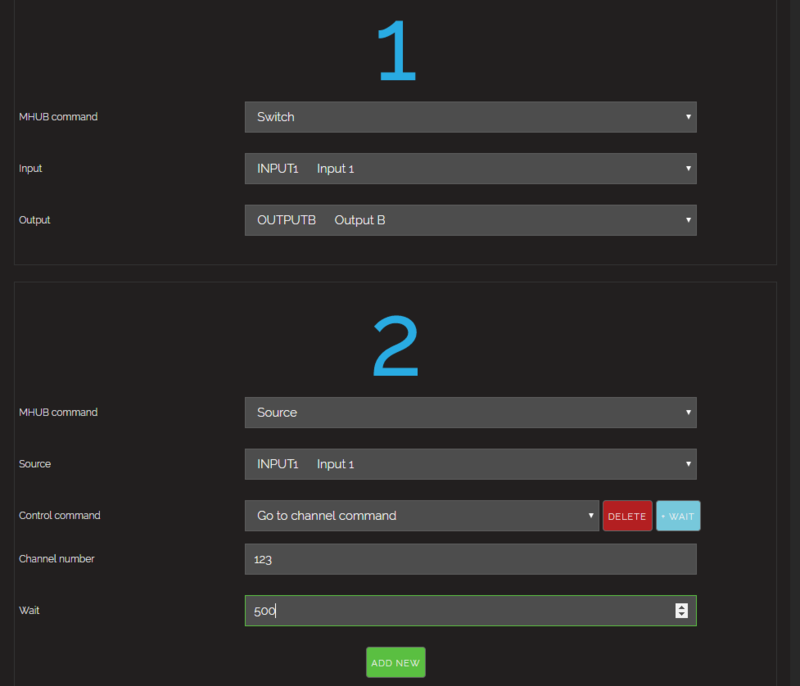 When input names are configured on MOS\MHUB SETUP page they will be reflected here. To change to a different output, tap on the menu icon, and select the desired output from the popout menu, once again any output names configured on the MOS\MHUB SETUP page will be reflected here. 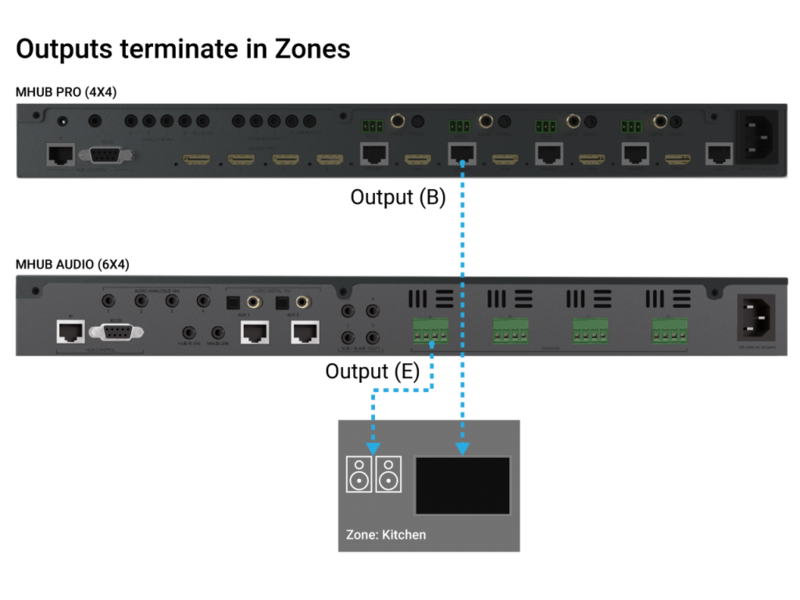 To enable uControl to control your source or display devices, an IR pack is required and must be installed on your MHUB. 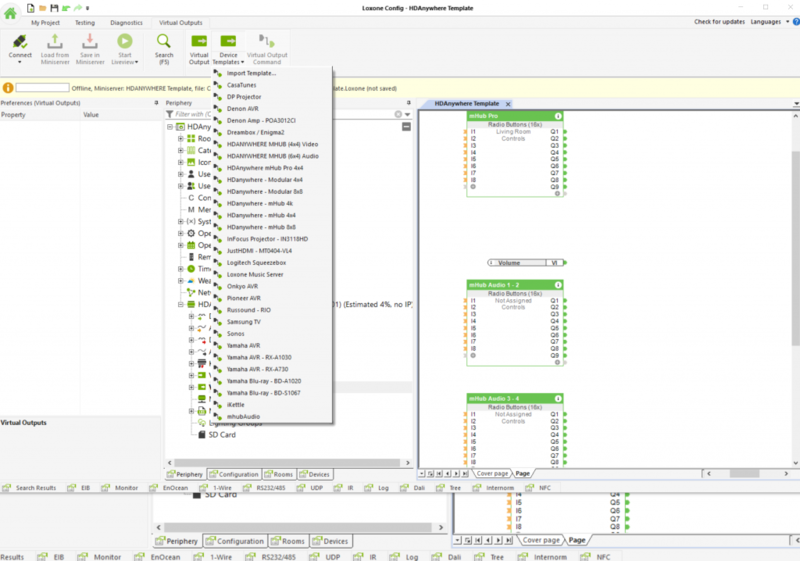 This IR pack contains all the relevant information including a screen layout for uControl. To install an IR pack navigate to the settings menu by pressing on the MENU icon, and tapping on SETTINGS located at the bottom off the pop-out menu. This will bring up the setting page, tap on DOWNLOAD UCONTROL PACKS. 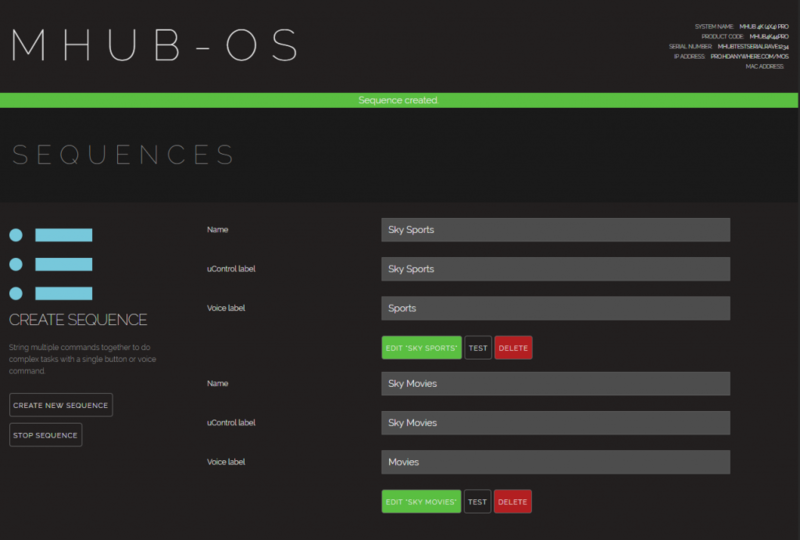 this will take you to the UCONTROL page on MHUB-OS. Click DEVICE TYPE to select the type of device that will be connected to the chosen port. Next click DEVICE MANUFACTURER and select the make of your device from the list and click on DOWNLOAD UCONTROL PACK – This will load two test commands from the downloaded IR Pack to confirm the commands are working as expected. When an IR pack has been installed the uControl area of the screen is populated with the source device interface. These are device specific. Some control packs have multiple interface screens which can be navigated to by swiping left or right. Navigation Control – This mirrors a conventional remote control, with individual buttons for navigation. Playhead Control – This screen contains common functions used when viewing a recorded source or watching a bluray. Such as Play, pause, fast forward and rewind. Numeric Keypad – This screen shows a 0 to 9 keypad for entering channel numbers etc. External App – This allows uControl to open external applications such as Sonos. 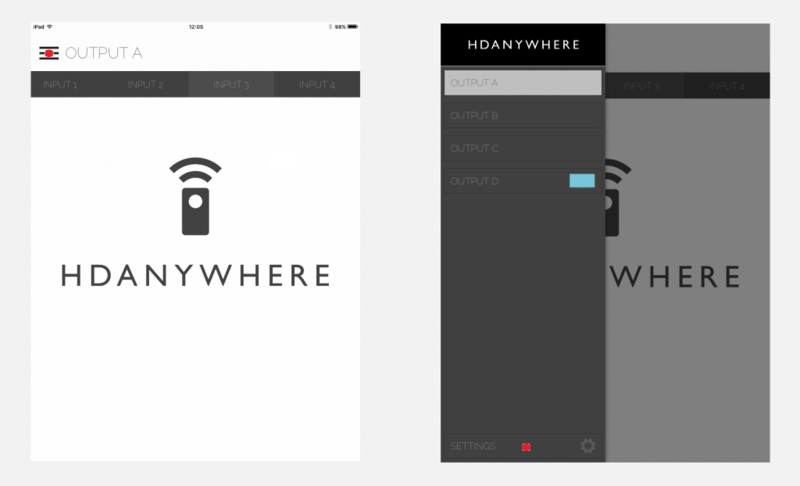 Play/Pause – two finger swipe up to play, two finger swipe down to pause.